An attractive, French copper, fancy border, ring mould dating from c.1880. The side of this mould is engraved with a cockerel above the number '318'. The cockerel is the mark of the French company Letang and 318 would be the pattern number. The design, which looks very good when hanging, has simple, fluted sides and a rope twist top. 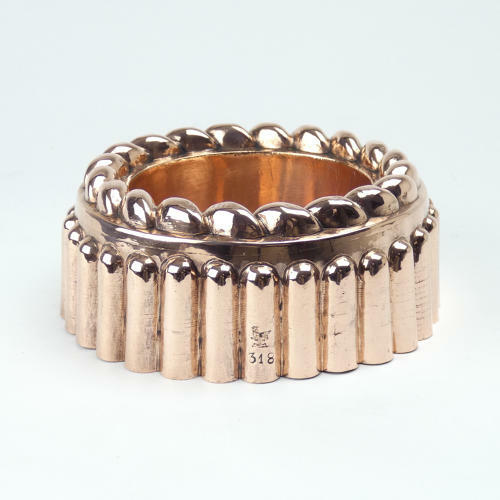 The mould is made from quite a heavy gauge of copper and it has a castellated seam up the inside. There is very slight marking to the copper on the side of the mould but other than that it is in very good condition. The tinning, to the interior, is slightly worn and a little flakey.